In seventh century Arabia, a middle-aged man had a vision to create a new religious and social order for a largely pagan and tribal society. The man, Muhammad, told his band of followers to behave wisely and civilly. “The best among you,” he said, “are those who have the best manners and character.” More than 1,000 years later, Muhammad’s wisdom would be echoed again, this time in the British colony of Virginia, by a 13-year-old schoolboy jotting down a lengthy set of behavioral rules that would later be published as “Rules of Civility.” The schoolboy was none other than George Washington, who would one day become the first president of the United States of America. Muhammad and Washington may seem like an unlikely connection, but in fact, they share strikingly similar biographies. Muhammad and Washington were students of history, restorers of justice and fierce warriors who led their respective nations through successful revolutions. Both men united a large swath of political territory and served as the founding father for two unprecedented social movements — Islam and the United States of America — whose universal ideals would both spread throughout the world respectively. The connection between Muhammad and Washington can be explored further in the Holy Quran, the Islamic Scripture which documents God’s revelations to Muhammad, and “Rules of Civility,” a book which outlines Washington’s advice for the proper conduct of young American gentlemen. For Muslims, the Holy Quran is the literal word of God, while “Rules of Civility” is less concerned with religious affairs and more focused on social rules and behavior. The Holy Quran and “Rules of Civility” have different frames, but both texts — in a wider sense — offer guidance toward achieving a more peaceful and noble life. Muhammad and Washington advised their peers to keep their mouths free of foul language. In the Holy Quran, offensive name-calling is forbidden: “Let not some men among you laugh at others … Nor defame nor be sarcastic to each other, nor call each other by (offensive) nicknames: Ill-seeming is a name connecting wickedness” (49:11). In “Rules of Civility,” Washington said “[u]se no reproachful language against anyone, neither curse nor revile” (Rule 49). He added: “[s]peak not injurious words, neither in jest nor earnest” and “[s]coff at no one, although they give occasion” (Rule 65). Muhammad and Washington taught their peers to improve relations with others by using kindness and positive words. Both men hoped that using civil language would help groups avoid misunderstandings and create a more harmonious society. Along with his affinity for modest language, Washington also wrote about the importance of a modest appearance. “In your apparel, be modest and endeavor to accommodate nature rather than to procure admiration” (Rule 52), he wrote. “Keep to the fashion of your equals, such as are civil and orderly, with respect to times and places” (Rule 52). Modesty is also a theme in the Holy Quran: “Tell the believing men to lower their gaze and to be mindful of their chastity; in this they will be more considerate for their own well-being and purity…” (24:30-31). The Holy Quran requests that women “not display the charms of their bodies beyond what may be apparent thereof; hence, let them draw their head-coverings over their bosoms” (24:31). Muhammad and Washington wanted their peers to dress appropriately because a modest and clean appearance is an indication of healthy inner feelings and humble attitudes. Muhammad and Washington also believed in the virtue of humility. The Holy Qur’an states that “(t)he servants of the Merciful are those who walk on the earth in humility” (25:63) and that the “(s)uccessful indeed are the believers who humble themselves in their prayers” (23:02). In Islam, there is even the term ujb, which warns mankind of arrogance and the danger of exaggerating one’s accomplishments. Comparatively, Washington believed that “a man ought not to value himself of his achievements or rare qualities, his riches, his titles, his virtue or his kindred” (Rule 63). The humility of Muhammad and Washington was crucial to the early success of their fledgling nations. The direction of the Arab and American society could have had a much different history if Muhammad and Washington were egotistical and presumptuous leaders. Respect, especially for one’s parents, is also mentioned in the Holy Quran and “Rules of Civility.” Washington wrote that people should “[h]onor and obey” our natural parents, “although they may be poor” (Rule 108). Similarly, the Holy Quran calls for “good treatment” of parents: “Whether one of both of them reach old age [while] with you, say not to them [so much as] ‘oof’ [i.e., an expression of irritation] and do not repel them but speak to them a nobel word” (17:23-24). Muhammad and Washington understood the correlation between high character and respect. Both men realized that the key to a strong society is for people, especially families, to treat each other how they wished to be treated. While it may appear as an obscure similarity, Muhammad and Washington also cared a great deal about good hygiene. The Holy Quran, for example, states that, “Allah … loves those who keep themselves pure and clean” (2:22). Similarly, in “Rules of Civility,” Washington wrote that people should keep their “nails clean and short, and your hands and teeth clean, yet without showing any concern for them” (Rule 15). Washington added that people should wear clean clothing: “Wear not your clothes foul, ripped or dusty … and take heed that you approach not to any uncleaness” (Rule 51). Both Muhammad and Washington stressed the importance of maintaining a clean, well-presented physical appearance. They believed that good hygiene was a projection of a positive body image, which, in turn, reflected a healthy mind. 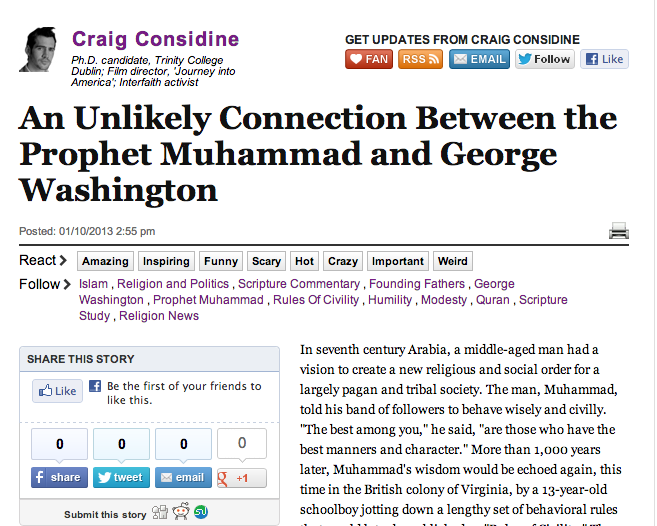 Ultimately, Muhammad and Washington were gentlemen of the highest degree. This is no more evident than in the connection between them in the Holy Quran and “Rules of Civility.” Perhaps Muslims worldwide and American could forge better relations if each group adhered to the advice Muhammad and Washington provided. Dr. Muhammad Taqi-ud-Din al-Hilali and Dr. Muhammad Mushin Khan, Translation of the meanings of the Nobel Qur’an in the English Language (Madinah: King Fahd Complex). John T. Phillips, II, George Washington’s Rules of Civility (Leesburg: Goose Creek Productions, 2003).